Shine On! Your lovely locks will drink in this nourishing nectar of essences and plant infusions. The perfect companion to our Seabuckthorn Shampoo, Shine On Hair Conditioner continues the botanic blessings for a healthy, happy mane. A bountiful blend of botanicals happy-hair herbal infusions fuse to add an unparalleled polish to your treasured tresses. This creamy conditioner loves locks with emollient oils and hair-tonics, which work in tandem to awaken the lusciousness in your tresses. Bring on the shine, beauty and bounty without weighing down your hair. Shine On is a versatile libation to inspire the best condition in your hair, as it may be used on wet or dry hair. After washing your hair, comb conditioner through hair while it is still wet. Rinse. Shine On may also be applied to tips of dry hair for extra conditioning. Apply to curly hair between washings. Perfect used after our Seabuckthorn Shampoo. 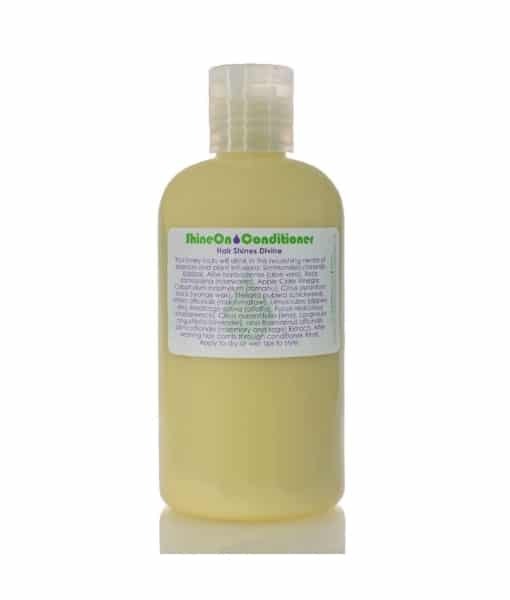 Lovely jojoba oil nourishes and revitalizes the hair and scalp, leaving hair happy and moisturized. Aloe is a botanical gem from the desert that ensures proper balance of moisture and promotes healthy hair. It is so easily absorbed into the hair and skin and harmonizes oily hair and moisturizes dry hair. It smoothes the hair cuticle and create an invisible polymer film on the surface of each hair strand, helping to lock in moisture and nutrients. Known for centuries as both a vital skin and hair tonic, rosewater stimulates strong, vibrant hair. The grace and sweetness of roses are innately healing to the hair. 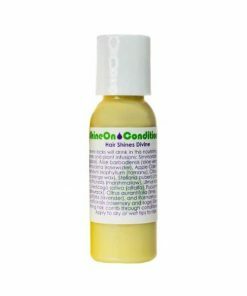 This sacred floral dew has natural moisturizing properties that revive the scalp and all hair types. Created through the fermentation of fresh apple cider, this vinegar is filled with vitamins, minerals, amino acids and enzymes. It is a wonderful rinse to improve the shine of your hair. Apple cider vinegar is also cleansing and prevents build up. Tamanu comes from a nut found in the South Pacific. It is very nourishing to the hair, skin, and nails. This nutty oil with an exotic fragrance has amazing restorative properties. A semi-solid wax that is extracted from the pressed peels of oranges, this special wax contains beneficial phyto-sterols. It creates a natural emulsifier that enhances the stability of our formula and holds the varied ingredients together. Orange wax also lends its sweet citrus scent and beautiful color to the conditioner. Bladderwrack Seaweed (Fucus vesiculosus) – This succulent seaweed is naturally mucilangenic, being both stimulating and tonifying for the hair. People from regions that ingest lots of seaweed have thick, beautiful hair! Bladderwrack feeds the roots and shaft of the hair. It holds moisture in the hair strands to reduce fly-aways and frizz. 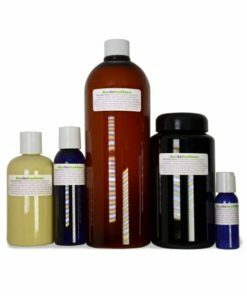 Herbal Infusions in Jojoba Oil – These herbs are individually infused in jojoba oil for several weeks. Some are soaked for a full moon to release the most hair-loving compounds. This sweet little white bloom grows abundantly and bursts with botanical benefits. As an herbal infusion, chickweed offers soothing lubrication to the scalp and hair. This is a beloved ingredient for bouncy hair care. It has a lovely, slippery texture which helps soften and detangle the hair. 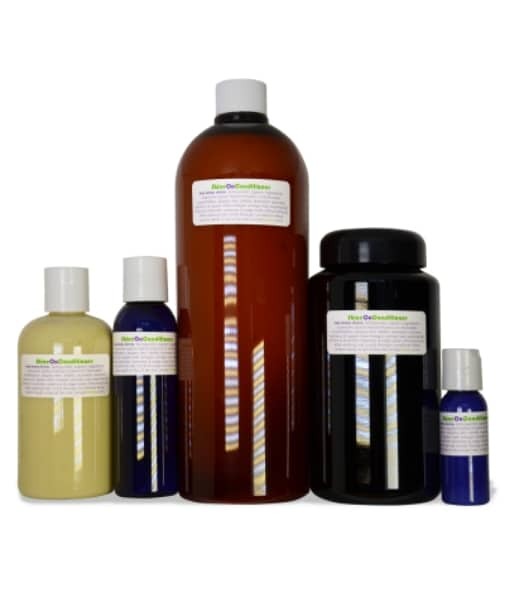 Its mucilaginous compounds are filled with proteins and vitamins that deeply condition the hair. This is another mucilaginous herb with slippery, soothing benefits that help to detangle and soften the hair. Slippery Elm comes from the bark of the tree native to North America. It also helps prevent “fly away” and frizzy hair. Alfalfa (Medicago sativa) Herbal Infusion – Alfalfa is rich in trace minerals and Vitamins K, B5 and C. It is a beneficial ingredient for strong hair. Lime’s fresh, citrusy scent supports shiny, happy hair. It cleans the hair by releasing build-up and renewing luster. Lavender brings its familiar calming fragrance to the mix and calms the skin and scalp. The benefits of lavender oil in hair care are endless. This oil is traditionally used to ease dry scalp, deep condition hair, promote hair thickness, and more. Sage + Rosemary (Salvia officinalis + Rosmarinus officinalis) CO2 Extracts – These cogent, concentrated supercritical compounds capture the full symphony of sage and rosemary as an extract which yields benefits for hair and skin, and sustains this conditioner’s freshness with opulent antioxidants. It works so well detangling my hair and moisturizing my tips. I use it every wash-day with the seabuckthorn shampoo and my hair is shiny, silky and my scalp happy.